Happy Veterans Day!!! Elections are over! and the winner is............ psh don't act like you don't know! It is Barack Obama! Congratulations on a 2nd term. I hope that these next four years do show a difference and do help everyone a bit. We seriously need more classes at school and more jobs for people. So to celebrate I decided to finally use my Obama nail water decals! Read on for my how to and more photos! This was the first time using water decals and ooh wee they are so simple to use. I made a how to for you guys. It comes in a small sheet and you just cut what you want on your nail place in water and tada! -I used a multiple tea light candle holder, so I just put one into each. I love the water decals. I received 3 other designs that I cannot wait to use, they are lovely. I will be purchasing more because they are quite inexpensive and really easy to use. 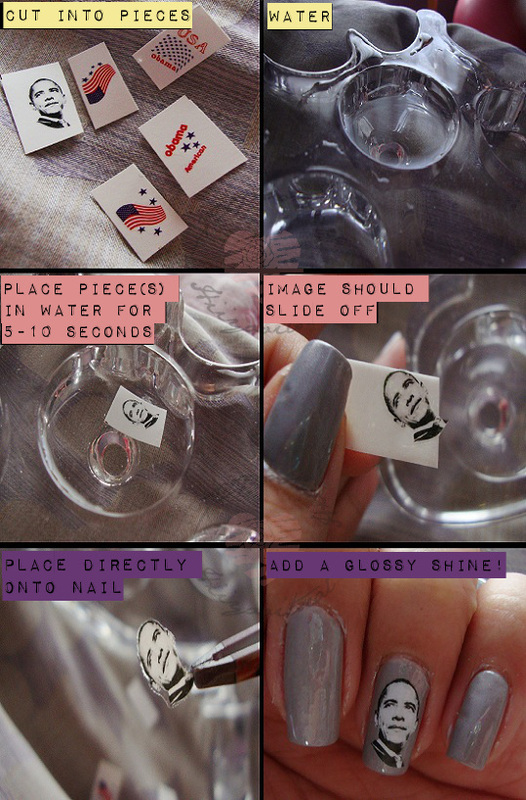 Water decals are non-sticky and are really thin, so you don't feel it's surface when you touch your nails. I hope you guys enjoyed my nails this week! I know I have been doing a lot of sponsored reviews lately but I am doing individual posts for each item in my influenster box and I am quite behind on reviewing products that were sent to me. I am currently waiting on products I purchased from eBay as well as ELF (their best sellers and new products) to review. I am also updating on my skin from using acne.org. Stay tuned for all the good stuff!